Have any of you ever used wood sorrel before? I had a friend over once who pointed to what I thought were clover and said, "So do you use that wood sorrel at all?" She had me taste a piece, and it's got this amazing lemony flavor to it. I'm trying to cultivate it as best as I can (which basically means not picking it and not letting the ducks get to it), but if I were to harvest right now I'd probably have a cup or two of fresh sorrel, which would likely dry down to a couple of teaspoons, maybe a tablespoon. Anyone ever use it in anything before? The only recipes I've seen that use it are "foraged" salads, but I'm wondering if there might be any good meat uses for this little wild herb. Maybe curing some salmon for gravlax or lox with this instead of dill? If you like this sort of thing then I can strongly recommend pancetta made with dried wild garlic flowers. Delicious. Let us know if you get any ideas. I'm very interested in wild foods that can be used in charcuterie so I picked and dried some wood sorrel last week. It was pretty crappy. Once dried, it lost all of that nice sourly flavour and instead just tasted a bit like the smell of cut grass. Don't think I'll bother using it dried in anything. If you do find other uses for it please let us know because I love wood sorrel. Chop it up, mix with garlic and butter and use on grilled fish, lamb or pork. 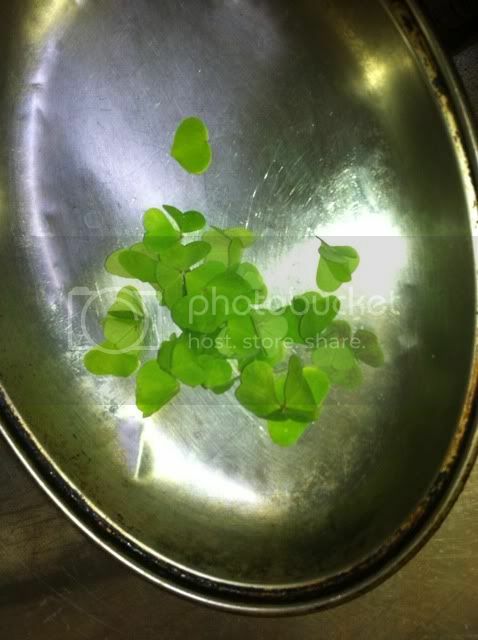 Be careful with the consumption of wood sorrel since its content of oxalic acid is rather high. Ryan C wrote: I'm very interested in wild foods that can be used in charcuterie so I picked and dried some wood sorrel last week. Oh man, that's disappointing. Our recent drought here killed off the patch I had growing before I could do anything with it, so hopefully it'll return when we start getting some water. It's also great mixed with yoghurt and cucumber, served ice cold. Either only salt and pepper, or with garlic and mint, like tzatziki. The calcium in the yoghurt also reduces the unhealthy effects of the oxalic acid. grisell wrote: It's also great mixed with yoghurt and cucumber, served ice cold. Either only salt and pepper, or with garlic and mint, like tzatziki. The calcium in the yoghurt also reduces the unhealthy effects of the oxalic acid. I can definitely see how it would be great in a tzatziki-like sauce. I liked to grab a leaf now and again to munch on while I was tending to the ducks or garden. I love that tangy citrus flavor. I'm real sad it's gone now. And they don't grow wild in your area? Over here you can get a bucket full in no time in just about any forest. Oh, they definitely do, but not so well in really high temps (100 deg F) with so little rain. It might come back once we get regular rains (despite the high temperature) but right now they're pretty much gone ... or at least the ones growing in the yard. 100 F? That's about the Swedish all-time record I think. Today it's 80 F which is unusually high so early in Summer. grisell wrote: 100 F? That's about the Swedish all-time record I think. Today it's 80 F which is unusually high so early in Summer. That's pretty common down here in New Orleans. Usually in the high 90s or up to a 100 with about 89% humidity. Heh. I was figuring if I ever get into fermented sausages I could probably do the fermenting outside in a cardboard box. Haha.